A little over a year ago, I was lucky enough the be the recipient of several pounds of 2-hole Twin seed beads, courtesy of the Preciosa Blogging for Beads program. It set my little beady brain into overdrive as I dug through my stash to see what other beads I could incorporate with these incredibly versatile little bits of glass to make my own unique beaded jewelry designs! More than a year later, I'm still on the 2-hole seed bead kick, dreaming up designs and experimenting with these innovative seed beads, and I seem to have acquired just about every color of SuperDuo and Twin seed bead in existence along the way. Because 2-hole seed beads are a lot different than your regular single-hole seed beads, so just keep a few things in mind as you design with them. 1. Remember that not all 2-hole seed beads are made alike. SuperDuos and Twins, despite their similarities, can't necessarily be used interchangeably in your beaded jewelry designs. SuperDuos are pressed glass beads, so that means that they are more consistent in shape and size than Twins, which are made by a totally different process. If you plan on substituting Twins for SuperDuos (or the other way around) in a beading project, don't be surprised if you need to make adjustments to other bead quantities and spacing in your beaded jewelry design. 2. If you're using Twins, cull those seed beads! Because the Twins are made by the traditional Czech method of drawing, cutting, and tumbling, you'll find more misshapen beads in your package. 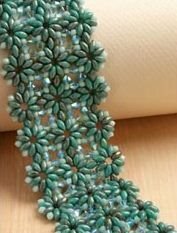 It's always best to cull the completely unusable beads before you begin stitching your project to make sure that you have enough beads to get through the entire project. Some beaders (like me) actually prefer the more organic look and shape of the Twin 2-hole seed beads, so they're perfect for freeform bead-weaving projects. 3. Check those bead holes for blockages. 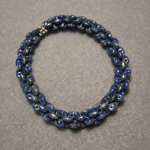 Some of my favorite colors of SuperDuos (pressed 2-hole seed beads) are made with coatings. And guess what? Those coatings can actually fill in the bead holes or block them completely, leading to unpleasant surprises when you try to pass through that second hole. If this happens to you, don't panic. You don't necessarily need to tear out your work and replace that bead! First, try to gently poke your beading needle into the blocked bead hole to loosen it up. If you can't clear it completely, use a beading awl and very gently insert the pointed tip into the blocked bead hole. Give it a little wiggle, and you'll find that you may be able to slip your needle through that second hole. (You can also use the tip of a fine-point bead reamer.) Don't forget to always wear eye protection when attempting to clear a blocked bead hole — you want to make sure your eyes are covered if you accidentally apply too much pressure and send tiny glass shards hurtling through the air towards your face! 4. Don't be afraid to experiment with your favorite beading stitches. SuperDuos and Twins are incredibly versatile seed beads, and that means you can do just about anything with them. Try playing with right-angle weave, herringbone stitch, peyote stitch, or your favorite off-loom beading stitch to see what kinds of beaded jewelry designs you can come up with! 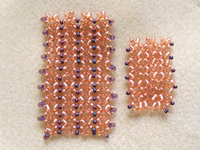 I loved adapting my favorite right-angle weave technique to be used with Twins and 3mm druk beads, and so did the readers of Beading Daily! 5. Think outside the bead. Another advantage of using 2-hole seed beads in your beaded jewelry designs is that they mix so well with just about any other type of bead! Personally, I love to combine them with very large or very small seed beads, other kinds of Czech pressed glass beads like round druks and flower cups, Czech fire polished beads, and even other 2-hole beads like Tilas. Dig through your stash and see if you find something that you've been holding on to forever — chances are, you can use those beads with your 2-hole seed beads! 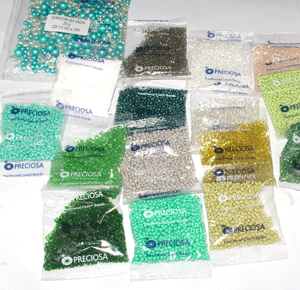 2-hole seed beads can be used for just about anything that your run-of-the-mill single-hole seed beads can be used for, too — edgings, fringe, and beaded ropes. Just pick up your beads and let your imagination play! Have you recently acquired your first batch of 2-hole seed beads and want to get started on some new beaded jewelry designs with them? Check out Stitching with Shaped Beads: 10 Beaded Projects to Make with SuperDuos and Twins, available as an instant download in the Beading Daily Shop! Because it's an eBook, you can be reading and beading with your new 2-hole seed beads in just minutes! You'll find 10 fantastic beaded necklace, bracelet, and earring projects using beads and components you probably already have in your stash. So, what are you waiting for? Check out this and all the great eBooks on sale now in the Beading Daily Shop and get instant gratification when you add to your library of beading projects! 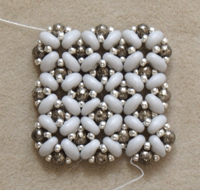 Do you have a great tip for someone who wants to design and bead with Twin or SuperDuo 2-hole seed beads? Leave a comment here on the Beading Daily blog and share your tips and advice for designing with 2-hole seed beads with us! When is Herringbone Stitch Not Herringbone Stitch? Learn How to Read a Charted Peyote Stitch Pattern in a Live Webinar!